In all its splendour and glory, the 1979 Ford station wagon family pauses for a 75th anniversary photo. Once upon a time, long, long ago, there were no minivans and the station wagon reigned supreme in the nation’s driveways and garages. This cavern on wheels was the hauler of choice for those who required the ability to transport goods and passengers with a modicum of class. There was almost no limit to what one could stuff into one of these versatile vehicles, virtually everything from a troop of Girl Guides to a gorilla. OK, maybe not a gorilla. The 1950 Nash Rambler Station Wagon was a posh compact entry into the world of station wagons. 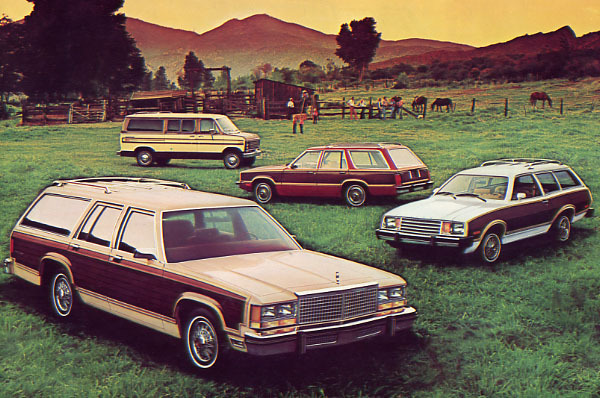 Then station wagons started to come in different sizes. Nash introduced the small but upscale Rambler station wagon in 1950. It took little loads in a very stylish way. When feisty independent Nash claimed 11 percent of North American station wagon sales for itself, the Big Three auto manufacturers began to re-examine the heretofore fringe segment of the market with renewed interest. The race for space inside of a car was on and suddenly, the station wagon explosion hit 8.3 percent of all cars built in Canada in calendar year 1962. The 1963 Studebaker Lark Wagonaire featured a novel sliding roof that permitted large objects--like refrigerators--to fit neatly inside. As the suburbs continued to mushroom so did the demand for the wagon. No longer utilitarian, the family hauler was a badge of honour, proof that one lived in a new home, in a new subdivision, probably on a new highway, somewhere away from the city centre. Wagons were dressed to the nines and could be decked out with every conceivable option known to exist under the aurora borealis. 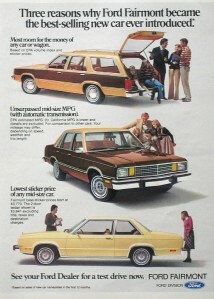 The marketing boys at Ford wisely covered the market neatly with a quartet of wagons, each in unique and distinctly sized categories for the 1979 model season. Oakville’s dual-purpose vehicles could be had for work or play and for use in town or country. 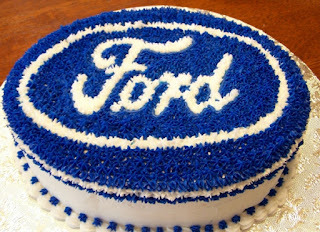 To make sure that the public got the point, Ford of Canada hailed itself as the nation’s Wagonmaster. The 1979 Ford LTD station wagon listed for $7,455 f.o.b. Oakville. Kick starting the Blue Oval parade was the luxurious, LTD Country Squire and LTD Custom 500 wagons. The biggest Fords in the corporate lineup were freshly downsized. Carrying the latest look in clean, boxy and upright European styling, they rode on 2 906-millimetre (114.4-inch wheelbases) and carried six people in comfort. 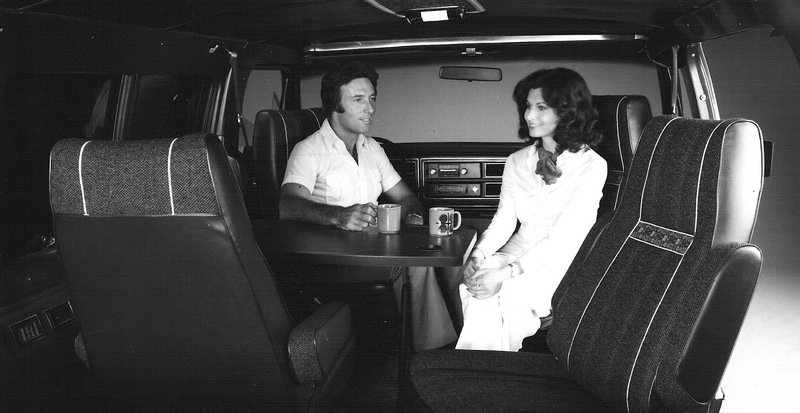 Though downsized, the LTD actually boasted more interior space than its predecessor. With the optional dual-facing rear seats in place one could bump the passenger manifest up to eight. When the seats were folded flat the cargo capacity added up to 2 598 litres (91.7 cubic feet) of space. 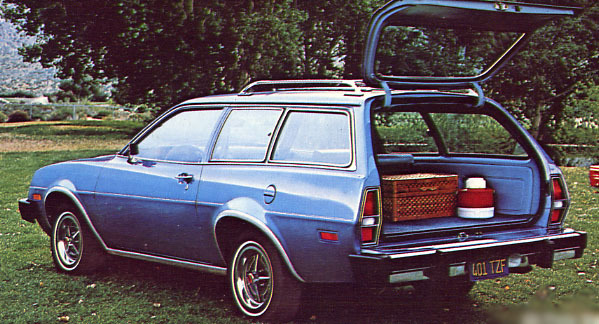 Ford’s compact wagon offering was the Fairmont. 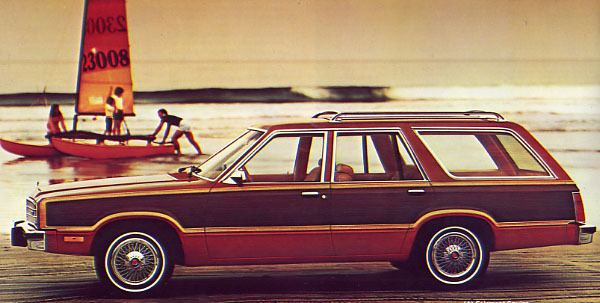 The upscale Squire sold for $5.466 in the 1979 model year. Consumers who didn’t want or need a wagon the size of the Queen Mary didn’t have to walk out of the Ford dealership disappointed. 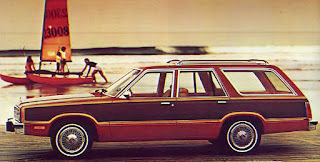 The LTD’s next of kin was the compact Fairmont. Having bowed to the public only last year, the popular seller continued with nothing more than carefully appointed refinements. The 2 680-millimetre (105.5-inch) wheelbase offered room for five passengers and still boasted 1 141 cubic litres (79.1 cubic feet) of hauling capacity with the seats folded down. The Fairmont was powered by the corporate 2.3-litre, four-cylinder mill, mated to a four-speed manual transmission. Rack and pinion steering, front disc brakes, colour-keyed carpeting and the signal, washer/wiper and horn all mounted on a Euro-style stalk were grace notes that made up part of the base package. A fancy Squire model offered woodtone look vinyl, deluxe wheel covers and a standup hood ornament among other niceties. If the Fairmont was still too big for the garage or purse, any salesman worth his salt would happily walk across the showroom floor to sing the praises of the pint-sized Pinto. Good for four passengers and a modest 387 cubic litres (31.3 cubic feet) of cargo space with the seat up, that quickly proliferated into 620 cubic litres (57.2 cubic feet) with the seat down. Of course, that reduced passengers to two instead of four. 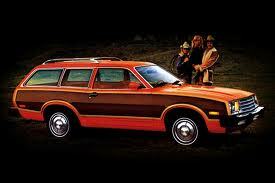 The smallest Ford wagon offered for the 1979 selling season was the Pinto, with is $4,464 price tag. Putting the attractive, facelifted Pinto through its paces was the 2.3-litre overhead-cam, four-cylinder engine with a four-speed manual transmission. Like Fairmont, every Pinto left the factory with rack and pinion steering and front disc brakes as standard equipment. This 1979 Ford Pinto wears optional Squire dress. An upscale Squire package for the Pinto offered an interior décor group with low-back bucket seats, deluxe trim that included woodtone appliqué inside and out. A wild model that bowed to the public was the Pinto Cruising wagon. This hauler carried some very hot multi-colour graphics applied to the body and a rear porthole to boot. 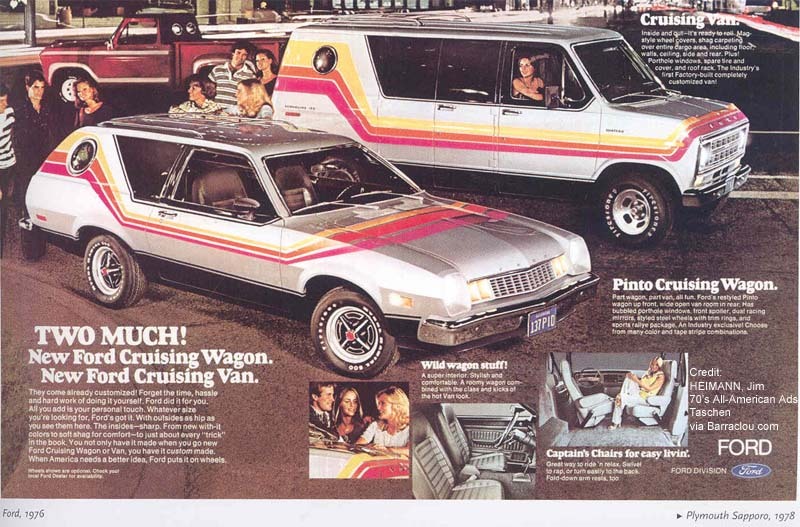 Both Pinto and the Club Wagon were given a "Cruising" package from 1977 to 1980. Last but not least in the Ford family were the Club Wagons. These were robust frame-on-chassis models that resembled the popular Econoline trucks they were derived from. They differed greatly from the utilitarian Econolines because they were appointed with features found in the most luxurious of automobiles. Seating configurations could range from four to a dizzying dozen, and with the Super Wagon, fifteen passengers could climb aboard. The Ford Club Wagon was based on the dependable Econoline truck. In 1979 these Fords rode a 3 149.6- millimetre (124-inch) or a 3 505.2-millimetre (138-inch) wheelbase. 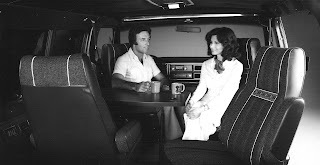 A Captain’s Club Wagon with reclining, swiveling seats and a snack and games table made entertaining on the road a pleasant thing. When the extended wheelbase Chateau mode was purchased, the rear seat folded into a bed for overnight fun. Interior of the Captain Club Wagon. A trailer package permitted hauling one’s home-away-from-home as long as the tag-along weighed less than 3 628 kilos (8,000 pounds). For trailering, an owner would want the 351-horsepower V-8 rather than the 117-horsepower six-cylinder motor. The five-speed manual transmission was optional equipment as was a four-speed manual with overdrive and the SelectShift Cruise-O-Matic setup. The Ford Motor Company of Canada, Limited marked its 75th anniversary in 1979. Domestic sales for Oakville held pretty much steady for the model year in comparison to the previous sales year. Unfortunately there was bad news south of the border. As a result of the OPEC oil embargo against the US, Oakville’s production was down significantly because of the battering taken by consumers at the gas pumps in the American market.